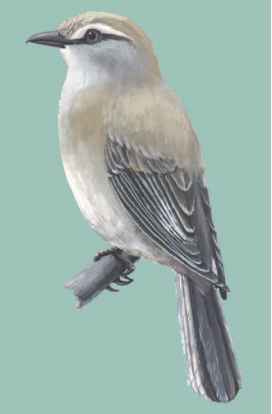 Physical characteristics: Also called brown flycatchers, jacky winters are part of the subfamily Petroicinae. They are 5 to 5.5 inches (12.5 to 14 cm) long and weigh 0.5 to 0.65 ounces (14 to 18 grams). These birds have sand colored crowns and backs, white and brownish gray wings and tails, and white throats and undersides. Their eyes are striking, bearing a white ring over their eyes. A stripe that looks like the stroke of an artist's paintbrush in black runs from the beak, over the eye, and to the edge of the white eye ring. Geographic range: Jacky winters are found in Australia and around Port Moresby in New Guinea. 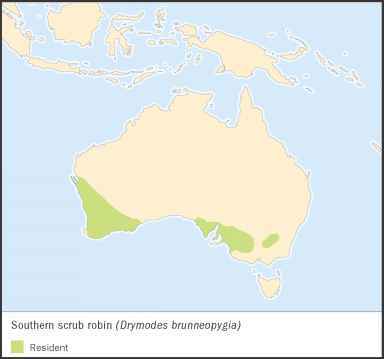 They occupy nearly all of Australia except for the desert regions, Tasmania, Kangaroo Island, and Cape York in the north. Habitat: Jacky winters prefer woodlands and scrub where there are trees and an abundance of insects. They will nest in gardens and on the edges of farmlands. Diet: These birds eat flying insects, beetles, worms, and insect larvae (LAR-vee), the newly hatched wingless form of insects. Behavior and reproduction: Jacky winters are not noisy birds. They stay within their local territories and often can be heard singing their repeated "peter-peter" or "jacky-jacky" songs or making whistling calls. They will often wag their tails from side to side or spread their tail feathers as a display when they feel threatened. Jacky winters dive for insects from a perch and take them either on the wing while in the air or by scooping them up as they fly low over the ground. Sometimes, they will stand and pounce onto their food. This species mates in the spring and summer months of the Southern Hemisphere, July through December. The female lays two to three light blue eggs that are blotched with lavender and brown. The nest, made of grass and roots, is built in a fork of a branch of a tree that is either living or dead. The eggs are incubated for sixteen to seventeen days. Both parents feed the young birds for fourteen to seventeen days.